Chanteuse Country US née le 14 Octobre 1938 à Iron City (Tennessee). 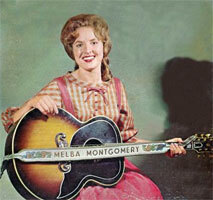 While a successful singer in her own right, Melba Montgomery is perhaps best remembered in tandem with her string of duet recordings with the likes of George Jones, Charlie Louvin, and Gene Pitney. Born October 14, 1938, in Iron City, TN, and raised in Florence, AL, Montgomery gained her first exposure to music through her father, a fiddler and guitarist who taught Vocals lessons at the town's Methodist church. At the age of ten, she was given her own guitar, and a decade later, she and her brother won an amateur talent contest held at Nashville radio station WSM's Studio C, which then housed the Grand Ole Opry. Montgomery's performance so impressed contest judge Roy Acuff that he asked the young singer to replace his departing lead Vocalsist June Webb; she accepted and toured with Acuff for the next four years. 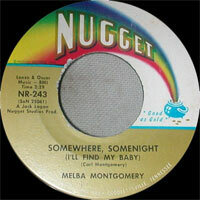 After going solo in 1962, Montgomery released a self-titled LP and then teamed for a series of duets with Jones. 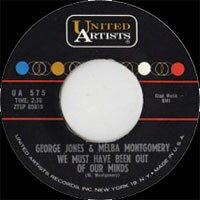 Their first joint effort, a rendition of Montgomery's self-penned "We Must Have Been Out of Our Minds," reached the Top Three in 1963, and the follow-up, "What's in Our Heart"/"Let's Invite Them Over," was a two-sided Top 20 hit. 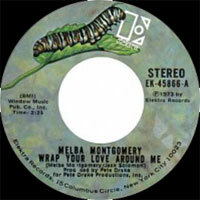 Between 1963 and 1967, the Jones-Montgomery team generated a total of five Top 40 hits and two LPs (1966's Close Together and 1967's Let's Get Together), and while Montgomery maintained a successful solo career during the same period, she remained best known as a duet singer and so recorded an album of collaborations with Pitney titled Being Together in 1966. 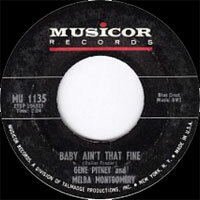 After a few minor solo hits in the late '60s, in 1970 Montgomery found new partners in Louvin and producer Pete Drake. The duo's first hit, "Something to Brag About," was also their biggest, and after a string of singles and a 1971 album -- also titled Something to Brag About -- she and Louvin parted ways, although Montgomery did continue on with Drake. 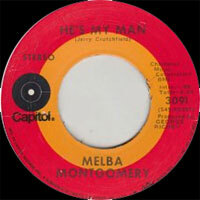 In 1974, he produced her lone number one hit, a rendition of Harlan Howard's "No Charge," culled from the LP No Charge. While she continued to record throughout the decade, subsequent albums like Don't Let the Good Times Fool You and Aching Breaking Heart found little commercial success, and by the 1980s Montgomery focused largely on touring and appearing at festivals. In 1988, she even published a cookbook of family recipes. 1962 SP NUGGET 605N-2800 (US) . 1965 SP NUGGET NR-243 (US) . 09/1969 SP MERCURY 72989 (US) . We're Living To Give / ? 07/1986 SP COMPASS 45-7 (US) . Straight Talkin' / ? 1987 SP GBS GBS-751 (US) . Almost Over The Line (with Lee DILLARD) / ? 198? SP GBS GBS-800 (US) . 1990 SP GBS GBS-806 (US) .